In a previous article about important RESTful principles and how to create a beautiful RESTful API, I used the example of a web service that kept track of an ongoing, global score for an online rock-paper-scissors application. 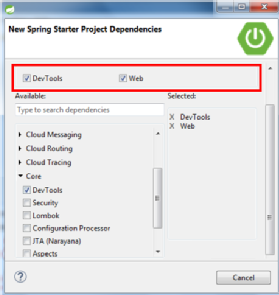 In this step-by-step Spring Boot RESTful web services example, we’ll implement that scenario using the Spring Web APIs and the Eclipse based SpringSource Tool Suite (STS) as the IDE. This step-by-step Spring Boot RESTful web services example in Java has very few prerequisites, but it does assume that you have the SpringSource Tool Suite (STS) installed. If that’s the case, you are ready to jump on the fast track to developing RESTful web services with Spring. 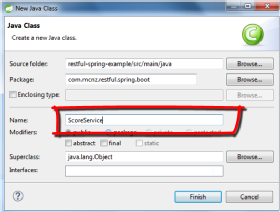 After you code the Score class, create a second Java component named ScoreService. We’ll use the ScoreService class to provide access to — and the ability to manipulate — the Score. The first iteration of the class used in this Spring Boot web service example will have getter methods that return the number of wins, losses and ties, along with update methods that can increment the number of wins, losses and ties by one. Note that you’ll use this same pattern match and String format approach again to return a JSON-based representation of the score in the updateScore method. And that’s it, a complete, step-by-step Spring Boot RESTful web services example that creates a fully functional Spring Boot application.